A Cranesbill (Geranium) or a Storksbill (Pelargonium)? Originally they were all Geraniums but Charles L’Heritier separated them in 1789. One of the differences is the shape of the flowers. Geraniums are radially symmetrical (5 similar petals) whereas pelargoniums have 2 upper petals which differ from the 3 lower. This leads me on to my newest acquisition. 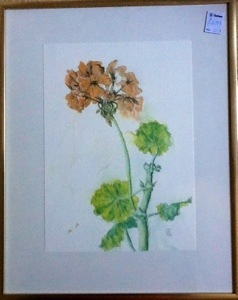 A print, numbered 287/700, of a geranium by Mary Elaine Courtenay. It looks as if the original was done with pencil and watercolour. It is rather charming and cost £2.99. This Cranesbill needs a new home.